I've been considering the direction of this blog for about a year now, but I was busy writing a book, so it's taken until today to start steering the blog in this new direction. It's a simple direction: I want this blog to be a resource for people who want to teach science fiction, fantasy, and horror at the secondary or post-secondary level. There are many blogs devoted to reading speculative fiction, and I'm not sure I'm adding much to the conversation. Instead, as I always recommend to new teachers, I'm going to play to my strengths, and talk about how I build courses, teach them, and revise them to teach them better next time. To start us off, I've been considering how to design a 300-level university course on Magical Realism which I'll be teaching in Winter of 2019. Whenever I can, I get started on designing a course as soon as possible, because I want my students to have the best learning experience possible. I started out designing this course on Magical Realism with a "usual suspects" approach. That is, I'd begin with the Latin American writers who pioneered it as a literary form: Gabriel Garcia Marquez and Isabelle Allende, to name a few. Add a section on "precedents" involving Franz Kafka and Jorge Luis Borges, and the course was half over before we arrived at English writers doing Magical Realism. My department isn't draconian about this, but there's a preference for avoiding too many works in translation. Given my background in Comparative Literature, I normally couldn't care less about limitations on how many translated works are in a course, but this one was difficult. I try to limit novels to six or seven for a 300 level course, and I was over the count. Our semesters at MacEwan permit twelve solid weeks of lectures, and I like to leave room for film studies and some elasticity around longer works. Sure, I could do short fiction by many of the writers of Magical Realism (Allende's Stories of Eva Luna is fantastic! ), but if you're going to teach Gabriel Garcia Marquez in a course on Magical Realism, you have to teach One Hundred Years of Solitude, and it's massive. I clock out how much time a book will take to read, not by page count, but by audiobook speed. After all, that's how long it takes to read out loud, slowly and deliberately. After all, even some English majors are slow readers! I try to keep the weekly read to 8 hours total. One Hundred Years of Solitude is fourteen, which meant (to me), a two week study. Again, I'm losing room in the course fast. Rushdie presents the same problem with Midnight's Children, but there are options for that. Furthermore, MacEwan University already has a course on the books for people looking to study Latin American magical realism. It's taught by our Spanish department, which means you have to learn the language to take it, but nevertheless, we have one. So between length of texts, the limit on works in translation in our English department, and the fact that we already have a course devoted to Latin American Magical Realism, I decided to (nearly) abandon that aspect of the course altogether. Limiting the course exclusively to Magical Realism in English made the process of choosing texts much easier. The field narrowed considerably. It means missing out on Murakami, but there are sacrifices I'm willing to make. Furthermore, the approach we'll take in the course will be exploratory in a way that will enable students to read Magical Realism outside the English tradition and analyze it and appreciate it as part of this larger literary approach. So I kept in Gabriel Garcia Marquez and Isabel Allende for an introductory week on the history of magical realism. I'll likely use the oft-anthologized "A Very Old Man with Enormous Wings" for García Márquez, and "The Little Heidleberg" for Allende. Then we move on to the English writers. I chose one from each of the countries most often studied in Canada: Britain, the United States, and of course, Canada. Again, this is an intentionally exclusive move, as there are magical realist works in other English-speaking countries. The first round of writers will be "giants," inasmuch as there are such in the US and Canada. For Britain, Salman Rushdie - I'm thinking of assigning Haroun and the Sea of Stories with an excerpt from Midnight's Children. For the giant of magical realism in the United States, despite there being a number of possibilities (Alice Hoffman for one), I went with the one who came up frequently in my look at secondary sources: Toni Morrison's Beloved. I've learned over the years that it's unwise to choose too many works for which there is no secondary literature, especially if you expect students to do research. While I could demand students use general texts on magical realism, not all will be able to do so. And then for the Canadian giant, inasmuch as there are good reasons for teaching Shoeless Joe by W.P. Kinsella, it's too much about the All-American sport to feel terribly Canadian, whatever that is. Instead, I chose Life of Pi by Yann Martel. Once we're through the giants, I want to look at revisions to the idea of magical realism - texts which are getting labeled Magical Realism or perhaps ought to be. Challenging the definition, if you will! I retain the British, US, and Canadian trichotomy, starting with Neil Gaiman's Ocean at the End of the Lane for Britain. This will also permit a good discussion of the difference between fantasy and magical realism, since that is usually how Gaiman's work is categorized. For the United States, I'm torn - I have two really great contenders. Helene Wecker's The Golem and the Jinni on one hand, and Tom DeHaven's It's Superman! on the other. I might just say "to hell with it" and assign seven books for this course. For Canada, my revisionist work is likely going to be Alexi Zentner's Touch, which he called "mythic realism." It's an incredible book - one of my fave works of Canadian literature. Interspersed throughout the course, I'd teach a few magical realist films - Field of Dreams, Midnight in Paris, Beasts of the Southern Wild, Big Fish...it would be tough to choose only a few! But I'm also giving thought to a "Superheroes and magical realism" portion to the end of the course - looking at DeHaven's It's Superman!, Busiek and Immonen's comic Secret Identity, and Shyamalan's 2000 film, Unbreakable. I'll update you all on my approach to teaching this course as Winter 2019 draws nearer! 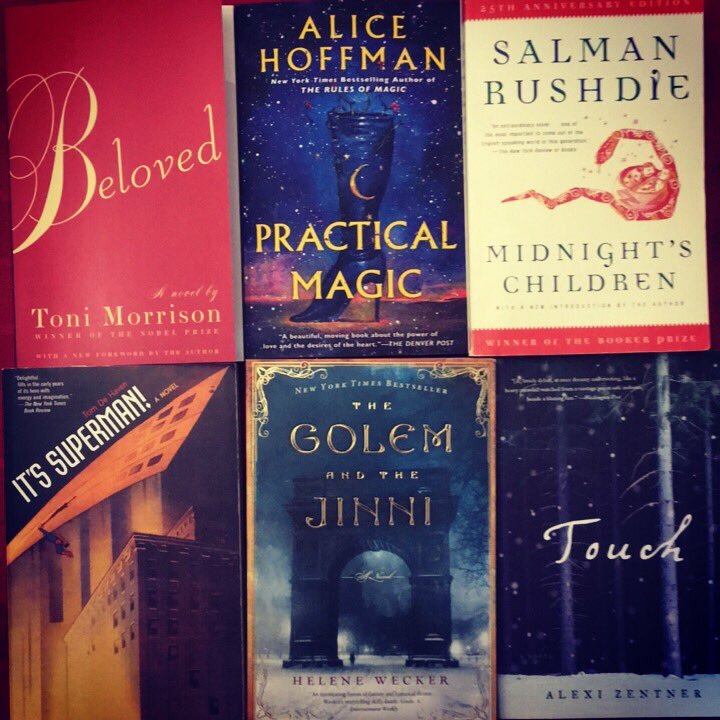 In the meantime, feel free to give feedback, share your own experiences with reading Magical Realism, or dig into one of these books and read along! I'm currently reading Morrison's Beloved for the first time, as well as re-reading DeHaven's It's Superman! and Wecker's The Golem and the Jinni.